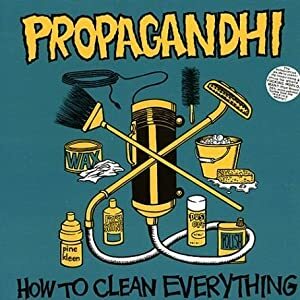 Propagandhi Charity Contest w/ Old-School Vinyl Prize Pack! Propagandhi released a digital rarities EP on April 6, 2010. All net proceeds will raise money for Partners in Health (currently involved in the reparation of Haiti). The three song EP features unreleased tunes that stemmed from 1993’s How To Clean Everything and 1996’s Less Talk, More Rock sessions. The download contains high quality, DRM-free MP3’s and a 19-page digital booklet is also available as a free, secondary download. For fans of underground thrash, The Weakerthans, and Lowest Of The Low. Find out how that’s even possible! $3 for 3 songs, for charity AND your chance to win a Propagandhi vinyl prize pack. 1. Buy the EP, via the secure G7 Welcoming Committee web store. NOTE: Comments are NOT visible to other people. They await moderation and will NOT be posted. Open to residents of Canada and US only. Tell your friends. You don’t even need to like the tunes to want to donate. The prize pack could make a great gift!